Adapted from the famous Chinese novel “Tracks in the Snowy Forest” set during the civil war era of 1946, when ruthless bandits occupied Northeastern China and threatened the lives of civilians there. The most powerful bandit of all was Mountain Eagle (Tony LEUNG Ka-fai), with an impenetrable fortress up in Tiger Mountain and armed with strong artillery. Unit 203 of the Liberation Army, led by SHAO (LIN Gengxin), was crossing the Northeastern region when they encountered Eagle’s men raiding a village. SHAO decided to stay and fight against Eagle. Headquarters sent a skilled investigator YANG (ZHANG Hanyu), who infiltrated Eagle’s gang as an undercover. The duo was soon engaged in a battle of wits with the cold-blooded Eagle, deep inside the snowy forest. At the first glance (at the movie poster), this is definitely not the usual film that many people would catch. However, before the film was aired in Singapore, I’ve seen many positive review circulating online. Thanks to Clover Films, I got to watch this film directed by Tsui Hark, the director who filmed most of my favourite childhood Wong Fei Hong films starring Vincent Zhao and Jet Li. While this film was adapted from a 1957 novel, a famous opera, as well as a real life story, I thought the story was a tad too dramatic, not that I didn’t like it, Lin Gengxin was almost a Captain America in the film with his leadership quality, and Chen Xiao (the recent Yang Guo in the New Condor Hero) as one of the be-spectacled Harry Potter-lookalike Gao Bo was like Bucky Barnes, Steve Roger’s best friend. What I like about this film was how they made use of many popular actors and dressed them up in a such a way where they were almost not recognizable, unless you are their super fans. Chen Xiao and Tony Leung as Lord Hawk was one of the many examples. While fans of these famous opera will love this adaptation, people who do not know about it might find the film over the top, with tanks, bombs and jet planes hidden in the Tiger Mountain. I had to admit that I enjoyed the 3D action, the excellent acting from majority of the cast, especially the hilarious bandit brothers, and Zhang Hanyu as Yang Zirong, the main protagonist of the film. It was exciting watching him doing the infiltration and spying within the gang of outlaws, at the same time communicating with the squad below the mountain using the weirdest but most useful way. The story might not be as solid and rich as Tsui Hark’s previous works, but this is still a pretty good watch if you like military strategy films! The director Tsui Hark made this film as a salute to the many nameless heroes who had helped win this war, which turned into a revolutionary opera. In order to make the whole film more realistic, the director tried to make everyone speak in Northeastern mandarin. Han Geng acted as the descendent of Squad 203 and although he was labelled as one of the main actors, he had very little screen time. Actually, he was the only actor in the film that was appointed by the director. Tony Leung as the Mountain Eagle leader was so heavily made-up that many people did not recognize him in the film. The daily makeup took up more than 3 hours daily. Zhang Hanyu as Yang Zhirong, a spy for Squad 203 spent more than 2 weeks fighting imaginary tiger and being on an imaginary aeroplane. Check out The Taking of Tiger Mountain (智取威虎山)Chinese and English Wikipedia Site! 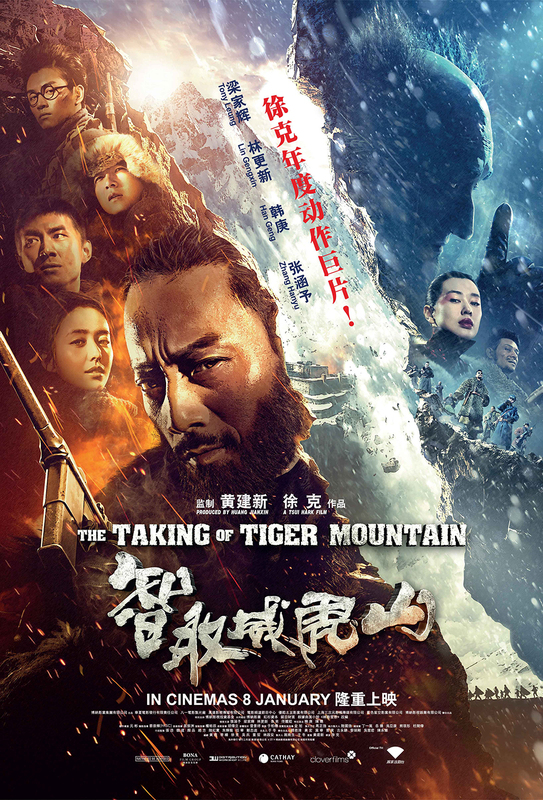 The Taking of Tiger Mountain (智取威虎山) is out in cinemas on 8 January 2015. You did an amazing job in reviewing this film. It made me understand more whether to watch it or not. Thanks. I am a fan of Tony Leung. He is a great actor! Hmm… not my kinda movies. Though the plot seem interesting. Most of Chinese films are either about or inspired from their past and culture which makes them interesting to some however, I’m not really a fan of these kind of movies especially if I’d watch it in subtitles because I tend to get bored even before it reaches the middle part of the story. I love expansive movies with great story lines and complex characters who surprise us. I’d love to see this movie. This is a must watch. I love asian history movies. Thank you for reviewing it. I will definitely going to watch this movie because Tsui Hark is my favourite director and most of his movie are artistic. These looks like a good movie on team work and leadership. I’ll check where I can see this movie. It seems that the film based on true events is an action-drama of sort. This made me curious to see this film if it opens in our local theaters. I love movies that have a war setting.Taking Tiger Mountain seems like a movie that I’d enjoy. I would like to read the book from where it took inspiration as well. Watched some movies like this one and cannot recognize them well. So, I was contented with plot of the story. If there’s subtitle in English so that I can understand scene-by- scene. I’ll try to watch this film. This looks like a fun movie to watch and seems star-studded, too! Thanks for the honest review and recommendation.